A very functional light weight cardigan hand knitted in cotton yarn. 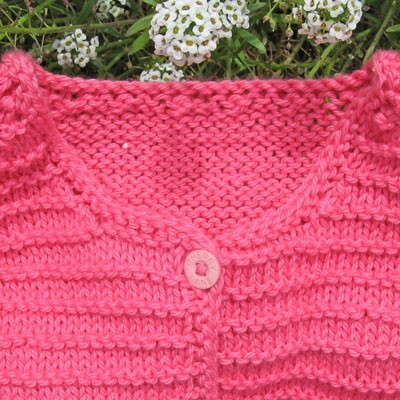 Cardigan has raglan sleeves, is knitted with purl ridges with a button at front neck. Yarn: 8ply cotton by Bendigo Woollen Mills. Colour - "Blush" - a shade of hot pink. Customer feedback is that this yarn wears and washes very well. Gentle machine wash. Dry flat. Size: 18m - 3 year old. Garment measurements: chest 54cm, length from shoulder 25cm. sleeve: 17cm underarm. Other colours and sizes can be ordered. Thanks for visiting my Merrilyn Anne Knits and Gifts. Please browse again as I frequently add new stock.